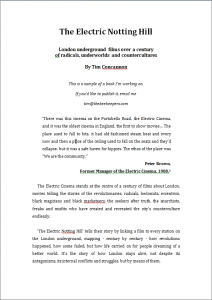 This is a sample of a book to go with our Scala map of London underground films. Former Manager of the Electric Cinema, 1988. 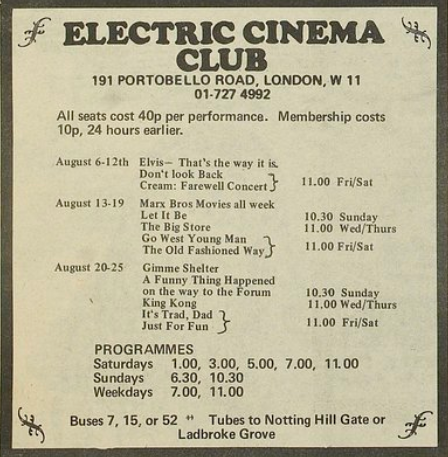 The Electric Cinema stands at the centre of a century of films about London, movies telling the stories of the revolutionaries, radicals, hedonists, eccentrics, black magicians and black marketeers, the seekers after truth, the anarchists, freaks and malingerer who have created and recreated the city’s counterculture endlessly. ‘The Electric Notting Hill’ tells their story by linking a film to every station on the London underground, mapping – century by century – how revolutions happened, how some failed, but how life carried on for people dreaming of a better world. It’s the story of how London stays alive, not despite its antagonisms, its internal conflicts and struggles, but by means of them. Another act to make a memorable appearance at the London Palladium, the Beatles, experienced equal difficulty in breaking away from the script for working class stars, one that was handed to them early on after their initial chart success. In the British light entertainment industry of the early Sixties, dominated by TV boss Lew Grade and theatre-owner Bernard Delfont, the path to becoming “all round entertainers” like Tommy Steel, Cliff and the Shadows was to make chirpy TV appearances and little films for the Saturday morning kids’ circuit, while being on the bill of the Royal Variety performance and endlessly touring between fading theatres on piers and seafronts in dreary seaside towns. Beatles publicist Tony Barrow took the view that it was after the band’s first appearance on ‘Sunday Night at the London Palladium’ on 13th October 1963 that “Beatlemania” took off. Lennon can be heard yelling at the screaming audience “shut up!” before they launch into ‘Twist and Shout’. Outside, a thousand screaming teenagers kept the Fabs in a “day-long siege,” as the ‘Daily Mirror’ reported it (a siege which the Beatles send up in the opening moments of ‘A Hard Day’s Night’ as they escape a mob of frenzied fans at Marylebone Station). “We don’t regard Wagner, or Beethoven, or Shakespeare, or Milton as great teachers. But when we start claiming for Lennon or McCartney or the Maharishi or any other of these pop prophets the ability to transport us to a region where God becomes manifest, then I see red. In acting and writing poetry, Lennon wanted to escape from the destiny that was assigned to anyone popular, highly talented, and from the North of England or otherwise considered working class: that “youth is youth, pop is pop, there’s no need to progress”; that the permissible apogee of their ambitions was to be a music hall performer rather than an Artist. It wasn’t until he met Yoko, left the Beatles and England, that Lennon was able to explore his other creative interests besides rock and roll, such as making films as well as appearing in them. These can be dismissed as Art School pretentions but Lennon had been to Art School, so there was no pretence about it; and to an Art College in Liverpool, moreover. The possibility of escape to America, even to an America of the imagination, was an ever present reality in a city where ships docked on the Mersey with holds full of the latest rhythm and blues records and comic books. In London after two world wars, the sense was not so much of the possibility of escape and more of chugging along the Thames, possibly stopping off in Graves End for a mid-afternoon cuppa, before returning home, to the tea time of the English soul merging – quietly, ineluctably, and without fuss – with an endless, communal dreamtime; to Gustav Holst’s ‘Mars, Bringer of War’ at the start of ‘The Quatermass Experiment’, to the theme to ‘Z Cars’ on evening television.